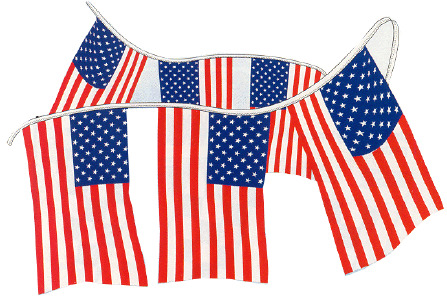 Patriotic American Stars & Stripes Flags on a string will draw attention to your marina or Independence Day-themed shopping center parking lot as the breeze blows through these flags designed to wave and turn passers' by heads in your direction. These beautiful 12"x18" American flags on a string are easily hung across your parking lot or marina entrance. There are 24 flags on each 60 foot string.